On view Saturday from 2-3pm. 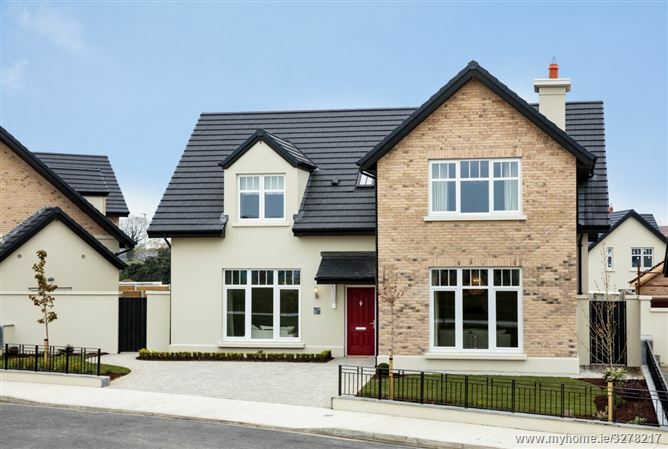 Rokeby Park comprises 71 large four and five bedroom detached "A" rated homes on an exclusive site near Lucan Village, located only moments from St. Catherine's Park and next door to Laraghcon in Lucan. O’Flynn Capital Partners have brought all their experience to bear on the design of these stunning detached family homes. These homes designed by Hogan Architecture take maximum advantage of the large sites, the verdant setting and are built to the highest development standards including increased floor to ceiling heights, triple glazing, well-proportioned reception rooms including an attractive wood burning stove, hand-crafted shaker style kitchens and luxurious bathrooms and en-suites. Lucan has a wide variety of shops, cafes, restaurants, bars and retail outlets. Local sports clubs include golf at the Hermitage and Lucan golf clubs. For the shopping enthusiasts there is The Liffey Valley shopping centre. Local schools include Castleknock College, Kings Hospital and Mount Sackville.